... Fusion Satellite Ready AM/FM Stereo, as well as a wet bar with solid surface top, sink, and faucet. Add on the optional wakeboard tower and portable platform grill to complete you’re on the water adventures! A wakeboard deck boat is a small, low-freeboard powerboat whose deck is fitted for outdoor activities, especially wakeboarding. Most have no cabin. These craft can be used for all towed water sports including wakeboarding, water skiing, banana boats and parasailing. They are also flexible enough for short outings, fishing or just lounging at anchor. They are not suitable for cruising or for activities during winter or in cold climates. 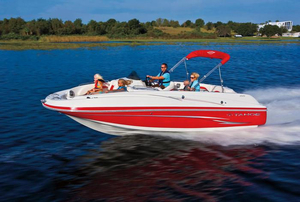 Such vessels are light and have powerful engines for towing skiers and wakeboarders. They are usually made of composite materials, generally laminated polyester fiberglass. The molded deck incorporates seats, benches and sundecks both fore and aft to enhance enjoyment of the outdoors. There are lockers for stowing water-sports and fishing gear. The amenities are sometimes modular, and can be adapted to different activities. Many models have inboard, hydrojet propulsion. The absence of a propeller offers greater safety to those entering and leaving the water at the stern. Outfitting should be a function of your favorite activities, whether fishing, wakeboarding or water skiing. The expected number of passengers is another important factor. Modularity increases options and multifunction use.